PC enthusiasts dig the very fast solid-state drives that SanDisk builds, but the drives in the company’s Extreme Pro line can be pricey. 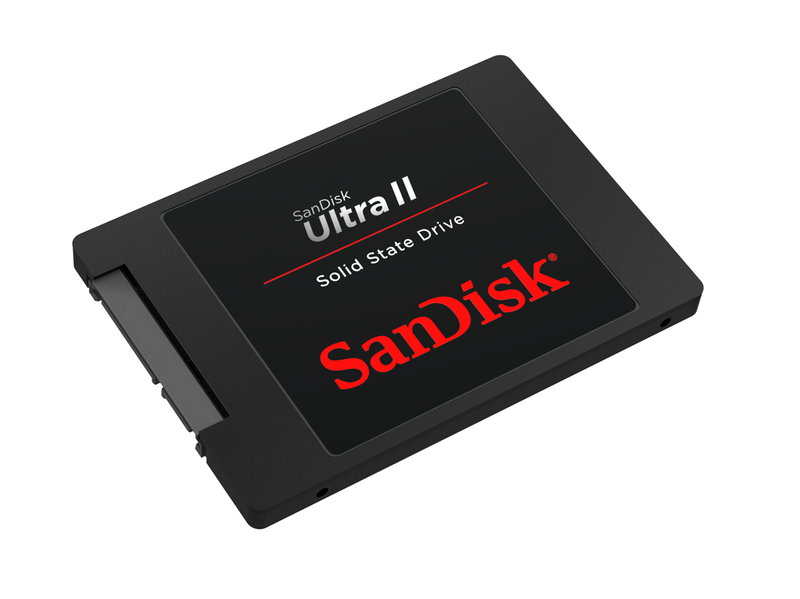 The Ultra II series of SSDs that SanDisk announced today target mainstream users who focus on price first and performance second. The Ultra II line delivers less performance and comes with a much shorter warranty than SanDisk’s top-of-the-line Extreme Pro, but the Ultra II drives deliver a similar boost in performance over conventional hard drives at a much lower price per gigabyte. 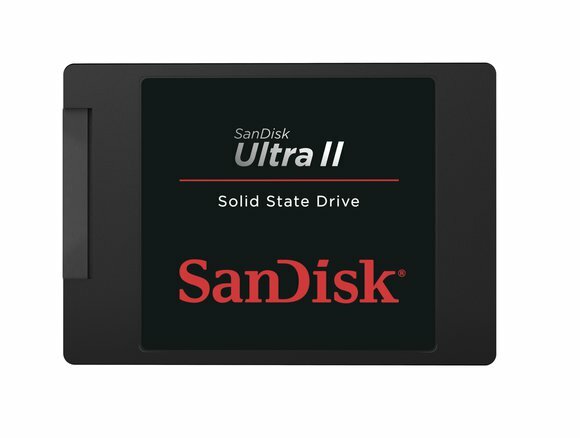 Where SanDisk expects to fetch $189 for a 240GB Extreme Pro ($0.78 per gigabyte), the company will be asking just $115 for a 240GB Ultra II drive ($0.48 per gigabyte). 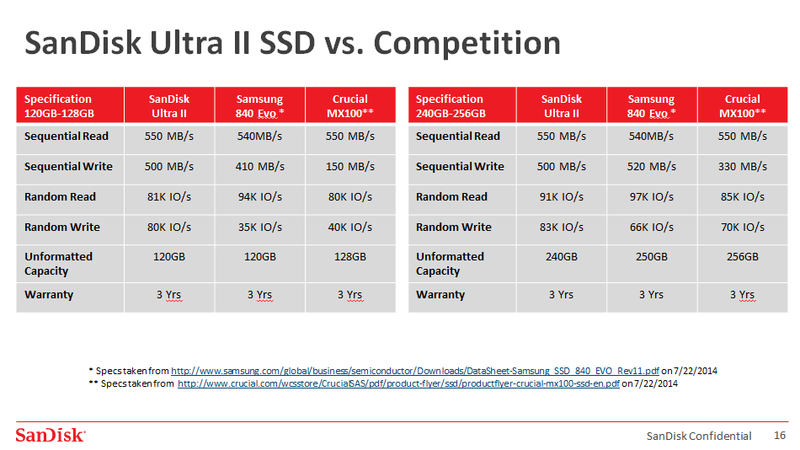 SanDisk claims its new Ultra II SSDs deliver performance in line with the competition. SanDisk is bundling three pieces of software with its Ultra II drives, including a single-use copy of Apricorn’s EZ Gig IV cloning utility. “There’s a high probability this is the user’s first SSD, and their first experience cloning a drive,” said Peck, describing the process of moving an image of the PC’s existing boot drive to a new SSD. This eliminates the need for the user to reinstall Windows and all of their application software. The software ceases to function once a successful clone operation has taken place, but it works with any SATA or USB-to-SATA cable. If the user doesn’t already have a cable, SanDisk will provide a link to a site where one can be purchased. SanDisk is also providing a six-month subscription to Trend Micro’s antivirus software “so you don’t clone any problems to your new drive,” Peck said. And to further protect your new investment, SanDisk will also provide a limited-time subscription to the LoJack stolen-PC-recovery service. SanDisk aims to hit a price point of around 50 cents per gigabyte with its mainstream SSDs. Of the three software titles, I suspect users will find the cloning software to be the most useful (the version available on Apricorn’s website works only with that company’s hardware products). You should already have some form of antivirus and anti-malware software on your machine, and you should run a scan prior to cloning your drive. As for LoJack, you can download a free 30-day trial version without needing to buy anything at all. Bundle deals like this often benefit the software company—in terms of exposure and the conversion of trial versions to sales—than they do consumers. Ultra II drives will come with a three-year warranty “because it’s in line with what the industry is doing,” said Peck. SanDisk offers a 10-year warranty on its pricier Extreme Pro series drives. “We went with a longer warranty [on the Extreme Pro series] because it’s a more durable drive,” Peck said.